Parents say many desks at a Greenbelt high school were empty Monday after administrators identified a potential gun threat on social media over the weekend. “There was only maybe a few kids in each class today because people just do not go to school if something like that happens,” parent Nicole Paquet said. 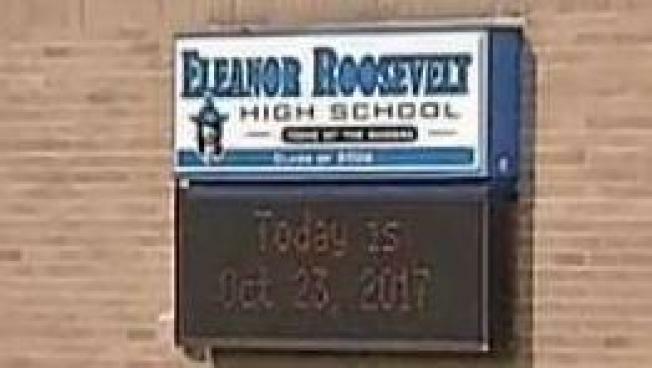 The threat was circulating among students at Eleanor Roosevelt High School, but did not specifically reference that school, officials said. Students believed it was a threat to them because of who posted it and how it spread widely on the social media app Snapchat. A Greenbelt high school is stepping up security after students were threatened on social media with posts telling them not to come to school on Monday, officials said. Police decided to step up patrols at the school and investigated the messages after school administrators uncovered a disturbing picture. A student showed News4 a photo of the concerning message. The picture shows a long, black gun resembling a rifle. The words "THINK IM KIDDING" are written over the picture in capital letters. It was later discovered that the weapon was actually a BB gun. A student at Eleanor Roosevelt High School showed News4 this photo of an alleged threat that circulated among students. 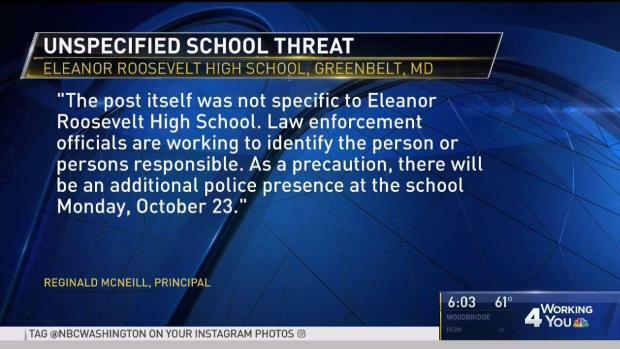 The school says the threat is not credible. Police said Monday that the threat was not credible, nor is it considered a mass threat because the message was initially private and shared between only two students. Then, it was shared widely on Snapchat. The student who created the post will not be charged. The school said Monday that it would excuse students who stayed home because they were afraid if their parents wrote a note. Classes will continue normally on Tuesday, the school said.